The lecture set a high standard for forthcoming lectures, the next one of which will be held on the Wednesday 24th October (7.30pm) when Dr Graham Leslie (BGS) will speak on What place for world class geology in future Singapore. EGS Public Lecture: What did the Ice Age ever do for us? Scotland’s scenery has been shaped by moving ice and meltwater over hundreds of thousands of years, but the Ice Age has also affected the sea bed around Scotland and it influences today’s society in surprising ways. 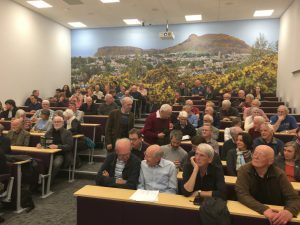 This public lecture, organised by the Edinburgh Geological Society and Dynamic Earth, gives the opportunity to hear first-hand about recent advances in our understanding of the Ice Age in Scotland. 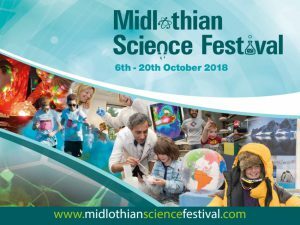 The event will be chaired and introduced by Hermione Cockburn, the scientific director at Dynamic Earth. Presenters are Carol Cotterill, Emrys Phillips (both from the British Geological Survey) and Tom Bradwell (Stirling University). Each speaker will give a short presentation outlining different aspects of the Ice Age, followed by a panel discussion with questions from the audience. Venue: Dynamic Earth, Holyrood Road, Edinburgh EH8 8AS. Parking is available in the Dynamic Earth underground car park (charges apply). Tickets £5, free for students and under 18s. Advance ticket sales are now closed – some tickets available at the door, but get there early in case we sell out. Doors open 6pm, lecture starts at 6.30pm. https://www.edinburghgeolsoc.org/egs/wp-content/uploads/2018/09/edinburgh-castle-cropped-1.jpg 2362 3146 Neil Mackenzie https://www.edinburghgeolsoc.org/egs/wp-content/uploads/2017/01/Edinburgh_Geological_Society_Logo_White_Slogan-1.png Neil Mackenzie2018-10-29 01:50:152018-11-22 20:06:35EGS Public Lecture: What did the Ice Age ever do for us? 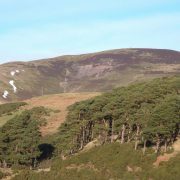 Join Victor Partridge from Forestry and Natural Heritage at the City of Edinburgh Council for this guided geology walk: From Fire and Ice. 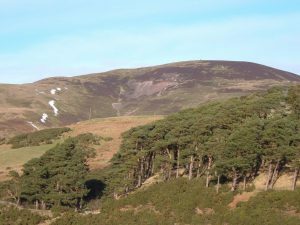 Come and find out how the Pentland Hills were created from volcanoes and glaciers on a moderate low-level 7 mile walk. Cost: £10 per person (concession £5). Over 16s only. The North West Highlands UNESCO Global Geopark spans 2000 sq km of mountain, peatland, beach, forest and coastline north of Ullapool, including some of the most well-known and important rocks in the UK. 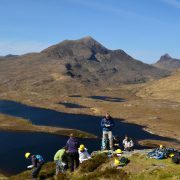 This half-day workshop, organised by the Edinburgh Geological Society will focus on the work of the Geopark, explore the historical development of ideas about thrusting and mountain building and give an overview of the modern understanding of the Moine Thrust Belt. 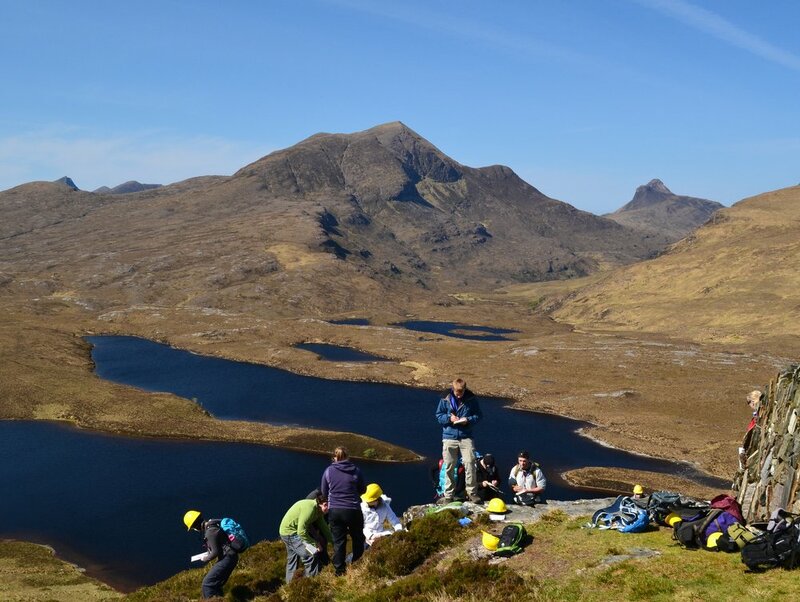 This is a great opportunity for anyone interested in geology to find out more about the Geopark, the UNESCO Global Geoparks network, and the geological story of one of Scotland’s most iconic regions. Venue: Southside Community Centre, 117 Nicolson Street, Edinburgh EH8 9ER. 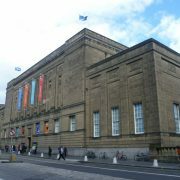 The venue is a short walk from Waverley Station. 11.15am Current understanding of the Moine Thrust Belt (Rob Butler, University of Aberdeen), followed by questions and discussion. 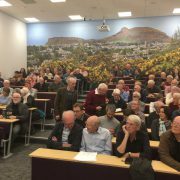 1:00pm Historical ideas of thrust faulting and mountain building, developed in the North West Highlands (Rob Butler, University of Aberdeen), followed by questions and discussion. 2:00pm The North West Highlands UNESCO Global Geopark. What is the Geopark, what does it do, how can we all support it (Laura Hamlet, NWH Geopark), followed by questions and discussion. There will be stalls from other organisations, loads of resources to browse and plenty of opportunity for informal discussion. 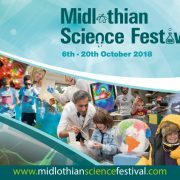 A walk with a geologist from Edinburgh University will reveal Midlothian’s long lost past tropical climate and the long lost industry of making lime for agriculture. Explore the fascinating world of a prehistoric time. Dig deep for fossils, create your own models of geological processes such as plate tectonics and erosion, and see a glacier in action! Learn about different rocks from around the world, from the high Himalayan mountains to the volcanos of Iceland. Create your own rock pet, plant your own jurassic fern, make your own dino feet, and discover where in the UK you can find dino footprints and fossils! Come see our giant volcano erupting and have some seismic fun making your own papier maché erupting volcano to take home using kitchen ingredients! Join Dynamic Earth and the National Museum of Scotland to explore the wonders of our planet. Investigate renewable energy with the National Museum, and get hands-on with building wind turbines and testing solar panels. And then take part in Dynamic Earth’s ‘Operation Earth’ programme and help to solve some of the challenges facing the land, air and oceans of our precious planet. Midlothian was once a tropical swamp – and the evidence is in the rocks. A walk in Roslin Glen with a geologist from Edinburgh University will reveal all. Neil Mackenzie (EGS), Bob Gatliff (EGS) and Doug Fleming (Siccar Point Energy) with one of the new signs. 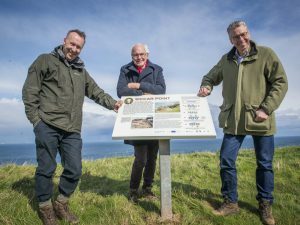 A Scottish Site of Special Scientific Interest of global significance in the history of geology has received a boost from UK oil and gas company Siccar Point Energy. 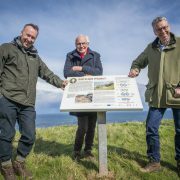 Named after Siccar Point in the Scottish Borders, the oil and gas operator has formed a partnership with Edinburgh Geological Society to back its efforts to improve the visitor experience around the remote site. 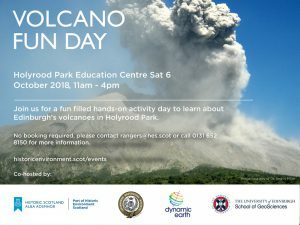 We are very sorry to say that, due to circumstances beyond the control of the organising group, Volcano Fun Day 2018 has been cancelled. We are extremely disappointed about this, given the number of volunteers and organisations involved in this superb event. Volcano Fun Day will return! The eight annual Volcano Fun Day is coming up, and every year it’s bigger and better! 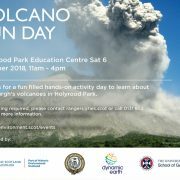 Join us for fun-filled, hands-on activity day to learn about Edinburgh’s volcanoes. No booking required, contact the Holyrood Park Ranger Service for more information rangers@hes.scot or 0131 652 8150.